Jun - 26 | By: Matt Haley | no comments. I thought one could only make film in Hollywood. Then, I made a short in Portland and it changed my life. Our stars Mindy Machen and Leonard Roberts in the cockpit of the Blackstar built by production designer Jubal Nance and art director Rob Taylor. Los Angeles was the place I flew down to for meetings between long walks on beaches that felt hotter than the surface of the sun. Everything about L.A. felt like the polar opposite of Portland, the place where I had lived and worked as a comic book artist for years, first for Dark Horse and then for Marvel & DC, all the while coming up with ideas for film and television, ideas that made me feel excited not just as a creator but as a viewer. As a lifelong science fiction nut, I longed for the early days of the genre, with shows and movies that were inclusive, spanning unknown universes, representing all walks of life, aliens of every stripe and humans of every color. So you can imagine as I grew up, with all this hope and anticipation for the future how relatively bummed I became. Not that we didn’t make it to Mars. I have less and less interest in living in a pod clinging to barren rust colored soil. But where was the inclusive future we were promised? To my eyes it had been slowly removed, pulled further and further away from mainstream creative content. It was in the books I read and the comics but what about film and television? In 2010 I directed a proof of concept for a crime thriller and decided that directing was where I could make a difference as a creative. Out of all of these feelings came the concept for “Blackstar Warrior” a “fake” trailer for a “Star Wars” film featuring Lando Calrissian as the lead. Star Leonard Roberts points, shoots & scores. We planned the short film/movie trailer over the course of 6 months, shot it in 4 days and posted it to YouTube. After getting over 2 million views, YouTube took us down in fear that we were violating LucasFilm’s copyright. We countered with a letter proving parody and they put us back up, shattering our view counter in the process but gaining another half million views. It was a roller coasted ride made up entirely of a volunteer cast and crew and we could have only done it in Portland. Excited by the tremendously positive feedback we were getting from “Blackstar Warrior”, the idea was brought up that we could build a Sci-fi series of the same name, taking any reference to “Star Wars” out of the concept and making an homage to the history of African American filmmaking. 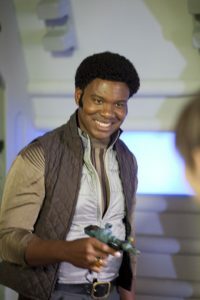 Our star Leonard Roberts (Drumline, Heroes, American Sniper) agreed to come back as a new character, Tyson Roderick, a space detective traveling the known universe in search of his real parents, solving cases along the way. The fun part of the concept was the idea that this show had actually been produced in the 1970’s and shelved for some unknown reason. To us, the possibilities were endless – we could use this show to say something about where were we going as a society and how we got lost somewhere along the way. Michael Friedrichs and another crew member prepare props for the shoot. So there is “Blackstar Warrior” the trailer, and “Blackstar Warrior” the show. Both were made from beginning to end in Portland Oregon with all the benefits that come with creating there. No sales tax, two hour flight from Los Angeles, trained and efficient crew willing to go the extra mile, and last but not least an incredibly supportive local Film Office. Portland gave us everything we needed to build an independent production. I moved to Los Angeles with the finished product in hopes of throwing it in the paths of anyone who might be inspired by the heart of it and so far it’s been working. “Blackstar Warrior” has to date been launched on the sci-fi web platform DUST, part of GunPowder & Sky Studios. Most recently the full pilot episode is exclusive to BrownSugar.com , a streaming service of Bounce TV. I’m here in Los Angeles thinking about my crew in Portland, grateful for what we created and looking forward to coming back to create the entire series. Like everything in the entertainment business, there are no guarantees but thanks to a supportive environment like Portland, Oregon in which to create in, the hard work is made infinitely easier. 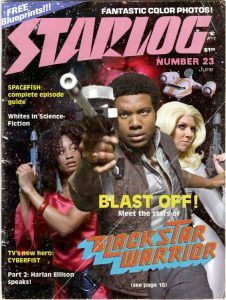 You can find out more about Blackstar Warrior, including behind the scenes images, “rediscovered” merch and updates on the series at blackstarwarrior.com.